Back Row L to R: "Big" Tom Crowley (Ratharoon),Dan Sweeney (Tullyland), Donal Welsh (Ratharoon), Christy Nolan (Knocknacurra), Jim Sweeney (Tullyland), Robbie Sweetman (Kilmacsimon),Danny Crowley (Horsehill). 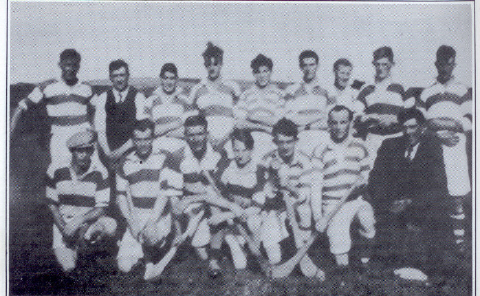 Middle Row L to R: John Nolan (Knocknacurra), Charlie Crowley (Rathrout), Bobby Scott (Rathrout), Davy Crowley (Kilneatig), Billy O'Connell (The Forge), Sonny Nolan (Knocknacurra), Micka Murphy (Innishannon). 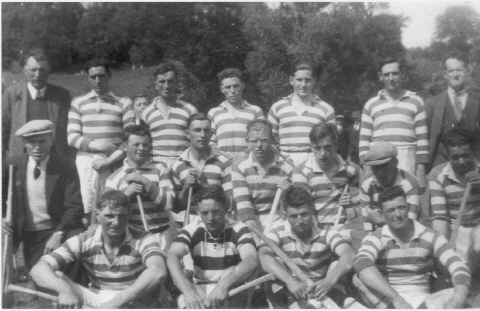 Front Row L to R: John Sweeney (Tullyland), Liam Manning (Dundaniel), Paddy Galvin (Dromkeen), Bill Sweetman (Kilmacsimon). Nolan in the centre and Sweeney on the wing. So three cheers for Ballinadee, we know there going to win. But I'm telling you they didn't know the boys of Ballinadee. But when they met the Courcey boys 'twas then they got the shock. Scotty in the centre is worth a dozen men. But Charlie made a great save and all went off serene. Sonny as a forward as lively as a hare. David takes a grand touch,'tis gone into the net. They got a bit excited that day in Enniskeane. But the handy boys of Ballinadee blew down the referee. So we wish them all the best of luck for 1944. And the hurling final had begun with a quick and desperate dash. Was witnessed by excited crowds on that September day. And bringing to the fore once more the Ballinspittle name. While Keohane and Jackie Donovan forever-quilled defeat. And were ably helped at centre back by the captain, Paddy Bowen. And fed the forwards with the ball who sent between the sticks. With Derry in the Centre to complete the line. While in full forward Hayes was there to slog the net. And bringing home the laurels after four and fifty years. That practice made them perfect and it brought the favorites ruin. As he trained his boys in sparkling style as only he could do. To Jim and all his gallant team whom we hope to have for years. As hurlers, yes real hurlers, 'neath the Ballinspittle name. Above kindly supplied (from memory) by Mr. Humphrey O’Sullivan, Castlepark. Winning 2 16's, Senior B and the PanCeltic from Tralee. So off to Necestown we went to see if we could win this late. And when the final whistle went Courceys were mighty victorious. To play Pan Celtic Senior B in conditions which were not merry. T'was the final of the county league, which we once again won out. No one knew when the game would be which us a little crusty. It was hard to know which way it would go would Kilbrittain or Courceys take over? But when Mary O'Leary found the net the match was completely altered. And the marvellous play of all on the field they soon left Kilbrittain behind. And Elaine was also very sad that she could not be with us. And Rachel was presented with the player of the final. but lets not forget the trainer, selectors and helpers too. Welcome back, well done, well done, roared the Courcey Camogie Champions.